Is it a Fairy Dress or a Butterfly Dress? It's both! Girls who like to make-believe no longer have to suffer with itchy costumes. Our Wings of Wonder WOW! dress blends costume with ready-to-wear clothing. 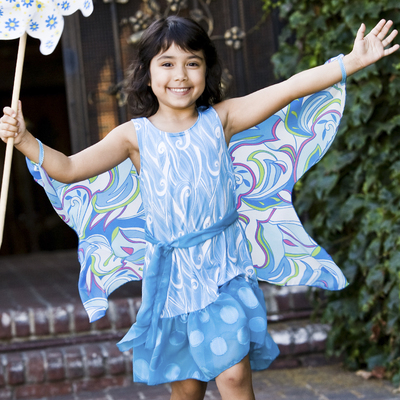 Just slip the wings to her wrist, and this garment instantly transforms into a butterfly or fairy dress. When it's time to return to human form, the wings drape beautifully down the back of her dress. The beauty of this twirly design is that it is durable, versatile and comfortable while at the same time inspiring creativity. What could be better?